Several hotels have near-perfect locations along the waterfront street that runs between Civitavecchia's railroad station and the cruise port: the three-star Hotel Mediterraneo, the four-star Hotel San Georgio, and the four-star Hotel de "La Ville", which is the subject of this review. The Hotel de "La Ville" is one football field's length from the railroad station. It's also handy to cruise ships: Just walk back to the train station and take an inexpensive shuttle to the port's shuttle-bus stop, where you can catch a free bus to your ship. 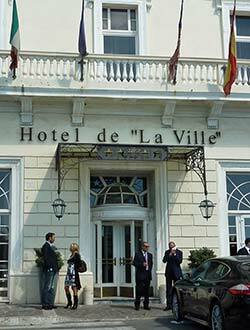 The Hotel de "La Ville" is a large 19th Century mansion that, if it were in Rome, might serve as an embassy or consulate. The spacious lobby is decorated with white-and-black marble, intricate plasterwork, flowers, and huge windows that bring in light from Civitavecchia's waterfront promenade. An elevator and a carpeted marble staircase lead to 37 guest rooms and 8 suites, many of which offer views of the Tyrrhenian Sea. Rates are reasonable for a four-star hotel: When I stayed at the hotel a few summers ago, I paid €100 for a large room with double bed facing the sea, with a buffet breakfast included in the price. Another big plus: The English-speaking reception staff are helpful and kind. How to reach the Hotel de "La Ville"
From the railroad station: Turn right as you leave the station and walk downhill. (The incline is gentle.) You'll reach the Hotel de "La Ville" in two or three minutes. From the cruise port: From your ship, take the port's free shuttle bus to the shuttle-bus stop outside the port. There, you can catch an inexpensive shuttle to the railroad station and follow the directions above. For captioned pictures of the hotel, see page 2 of this review. To check rates, or to book a room at the Hotel de "La Ville," click here.